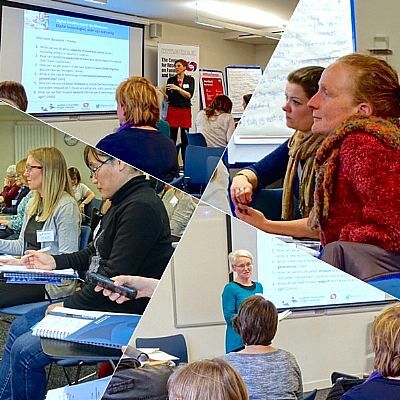 'Grey Matters' (GM) Meeting in Helensburgh, 3 December. Tom Berney provided an update on the Assembly to over 50 people who turned out for their regular Saturday meeting. They provided their responses to one of the key questions asked of delegates at the Assembly concerning reduction of ill-health and health inequalities. What preventative actions can be taken? Top right: Alison Gildea (TSI), SOPA chair Tom Berney and Rob Snodgrass (GM). Click here for Briefing Note of meeting. 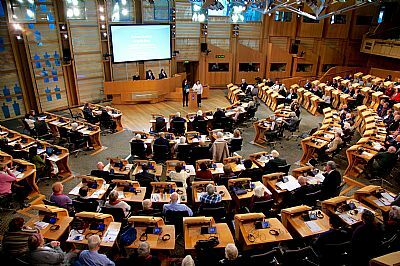 The Assembly addressed its Campaign Actions and heard from Minister Jeane Freeman MSP OBE of proposed Social Security arrangements in Scotland, as well as responding to important issues on health and wellbeing. Go to SOPA’s 2016 Assembly page for more information and to access the webcast links for both sessions. 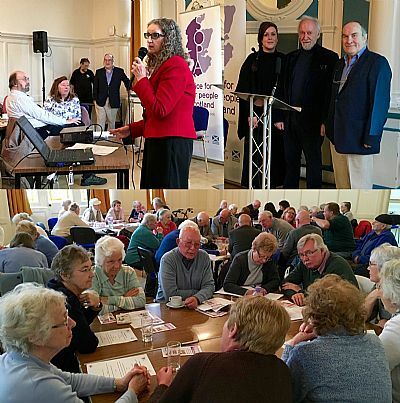 An open SOPA meeting was held in Dumfries today with Jeane Freeman MSP for Carrick, Cumnock & Doon Valley and Minister for Social Security. This was part of her social security consultation with people interested in the Scottish Government's proposed Social Security arrangements. Margaret Sanderson, Janice Sewell, Emma Harper MSP for South Scotland, Tom Berney, Councillor Jim Demptster, John McDonald, John White, Margaret Mitchell and Christine White. 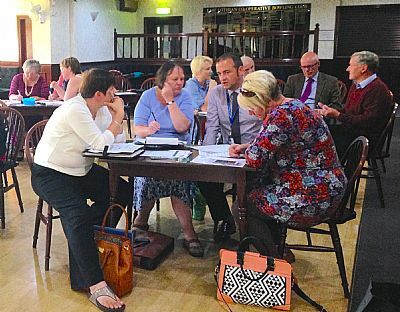 On 29 September SOPA held a local meeting at Galashiels. 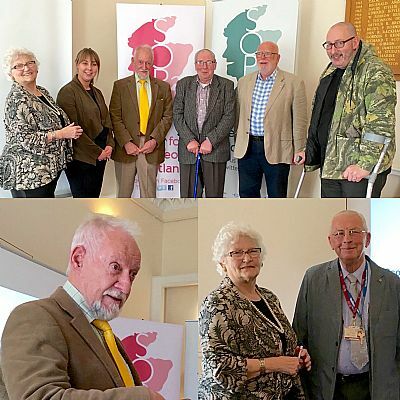 Diana Findley (Age Scotland), Jillian Scott (Community Capacity Building Officer, Scottish Borders Council), Tom Berney (SOPA Chair), Robin Cowan (Old Folks Welfare Group Peebles), Tom Ingoldsby (Borders Talking Newspapers), George Gilchrist (Royal British Legion Peebles). 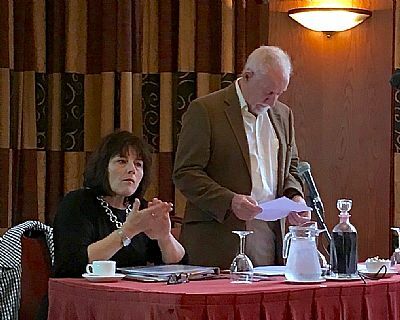 Lower L: Tom Berney, Lower R: Diana Findley and Councillor Willie Archibald, champion for older people Scottish Borders Council, who opened proceedings. Click here to see Briefing Note. 15 August - Tranent, Dementia Friendly East Lothian - sponsored by SOPA. The group was welcomed by Deputy Provost Jim Gillies and Iain Gray MSP. Picture: Group discussions on SOPA’s Campaign Issues and other concerns, plus feedback. Click here for Briefing Note. 4 August - Saltcoats. 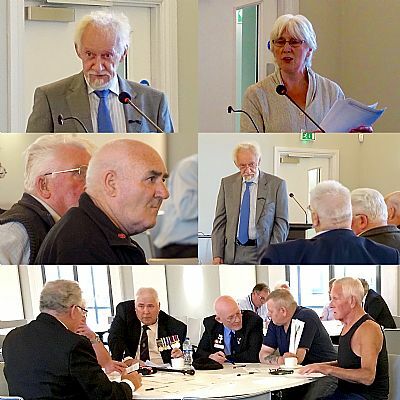 North Ayrshire Veterans. 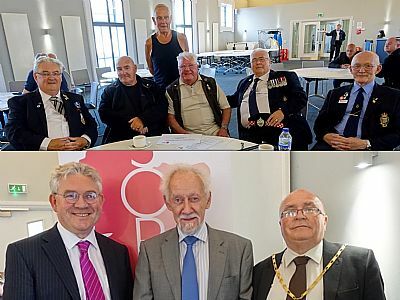 An all-male contingent attended a meeting of the North Ayrshire War Veterans sponsored by SOPA. Two important issues for current veterans are their financial circumstances and lack of preferential treatment in dealing with illness and disability related to injuries sustained as soldiers. In many other countries special priority exists for people from the armed forces who have seen action. They are keen that SOPA uses its influence to draw attention to these grievances with Westminster and Holyrood politicians. MSP Kenneth Gibson took questions at the end of the meeting and emphasized that pensions was not currently a devolved issue, so not within the power of the Scottish Government. Click here for Briefing Note from Meeting. Picture above Top - Saltcoats, Ardrossan and Stevenson (SAS) war veterans. Picture Below - (Left) Kenneth Gibson MSP, Cunningham North (SNP) and (right) Depute Provost Councillor Robert Barr (Scottish Labour). SOPA Chair Tom Berney (centre) was the speaker. 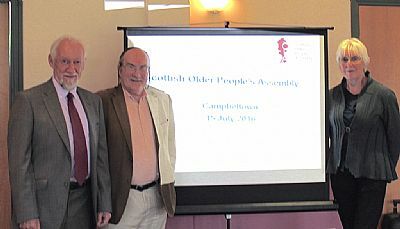 The first of SOPA-sponsored meetings around Scotland with older people's groups took place in Campbeltown. Ian McIver, from Argyll and Bute Third Sector Interface and Age Scotland, introduced Tom Berney, SOPA's Chair who spoke about the organisation's growing role in supporting and challenging policy issues. Everyone discussed their concerns, the 2016 SOPA Campaign issues, and identified their priorities in the campaign. (Photo: Tom Berney, Rob Snodgrass, 'Grey Matters' Helensburgh and Glenda Watt). See Facebook for more images. Click here to read Briefing Notes from the meeting. This event highlighted how digital technologies are being used by older people, their families and carers, and identified key issues. It also aimed to develop new collaborations between researchers, practitioners and policy-makers. SOPA was asked to present its perspective at this final seminar of the CRFR project. (For SOPA Powerpoint, Telecare film and other presentations see the CRFR project webpage). The event as chaired by Heather Wilkinson, Director of E_CRED, University of Edinburgh. In the morning there were academic perspectives and discussion on how children and their grandparents communicated more directly nowadays through email and iPads (Caroline Marchant, University of Edinburgh Business School), how people with cognitive impairments and their carers make technology work for them (Grant Gibson, University of Stirling), and the ethical issues surrounding this (Prof Maggie Mort, University of Lancaster). In the afternoon there were perspectives from Agnes Houston, Vice-Chair, European Dementia Working Group who demonstrated how ably someone diagnosed with early-onset dementia could continue to play a vital role in challenging helpless dementia stereotypes and how she used her iPad as a vital memory tool for daily living, as a camera to capture key moments in the day, for social contact to combat loneliness and for email. Gregory Hill-O'Connor from The Alliance gave a voluntary sector perspective about the increased use of electronic devices, but the lack of monitoring of how appropriate they were. Val Bissland provides an overview of SOPA's role as an umbrella organisation and highlighted that digital participation arose as an Action point from the 2015 Assembly and comes from a belief that being able to contribute, participate and engage is an important factor in the wellbeing of the older population. 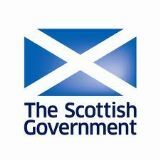 SOPA uses its website, eNewsletter and Facebook pages as communication tools to encourage engagement with digital media and demonstrate the value of being able to keep up-to-date with developments in Scotland and further afield. Professor Evan Magill, Professor of Computing, University of Stirling and speaker from Edinburgh Community Respiratory Team, NHS Lothian. 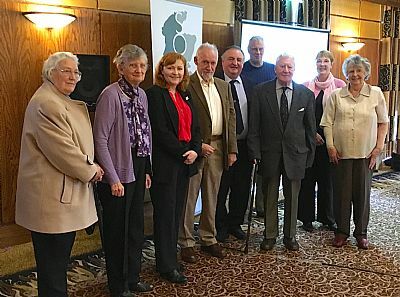 Tom Berney, Chair and Alan Sidaway, Vice-Chair, Scottish Older People's Assembly introduced the 6 minute SOPA video on telecare, produced specially for this event. 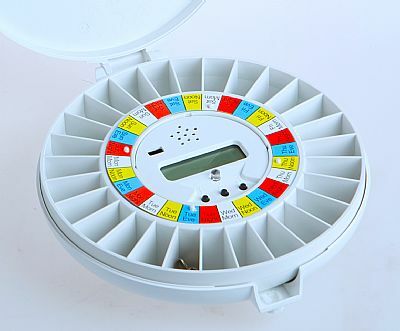 In it Neil Primrose talks about the immense peace of mind for his family provided by Edinburgh Council's Community Alarm Telecare Service in his grandmother's house, allowing her to remain in her own home.